After a wave of strikes and workers' action fuelled and empowered Egypt’s 18-day uprising, the burgeoning labour movement, subsequently empowered, began asserting itself: unilaterally declaring an independent trade union federation to rival its state-run counterpart and undertaking steps to dismantle the power dynamics and structure of the state's union. Recently, however, Egypt’s workers and unionists have found themselves fighting to maintain their gains. In March, Egypt’s manpower minister, Ahmed Hassan El-Borai announced the right of Egyptian workers to establish their own labour unions and federations, an action hailed by the International Labour Organisation. But a new trade union law is yet to be passed by Egypt’s military rulers, the Supreme Council of the Armed Forces (SCAF). 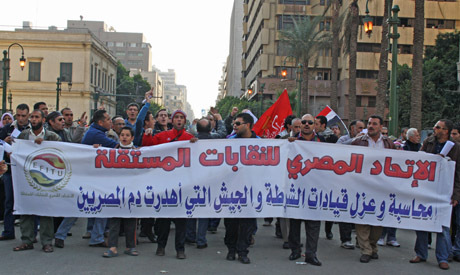 Following the August enforcement of a 2006 judgement, the state-run Egyptian Trade Union Federation (ETUF) board was dissolved. However, these steps have been stymied by the government’s continued reliance on members of the old-guard whenever it comes to implementation. This adds up, in the words of Hisham Fouad, a founding member of the Democratic Workers Party, to a government outlook that is “counter-revolutionary and opposed to workers’ progress.” Added to this, their refusal to consult directly with independent unionists is, for him, proof of a deeper intransigence and indicative of the ruling military council's desire to quell the movement. The decision by former prime minister Essam Sharaf to dissolve the ETUF board and freeze the general union's assets was a high point for independent unionists. But a sobering reality set in in its immediate aftermath. A steering committee consisting of independent, state-affiliated and Muslim Brotherhood unionists was tasked with examining the general union’s financial affairs. This de-facto board began reviewing reports by the Central Auditing Organisation: reports that contain hundreds of infractions and financial remarks linked to the ETUF as well as other organisations under its umbrella. Unionists found to have illicit financial dealings were supposed to be turned over to the prosecutor-general's office, but interests got in the way. The committee was paralysed by its multi-factional composition. When El-Borai was unable to put an end to the strike, he dissolved the steering committee and replaced it with another one consisting of figures from the old board – associates of Megawer. “We've regressed. The situation now is just like when Hussein Megawer was around,” states Wael Habib, member of the steering committee. Fouad believes that this move is a response by the ruling SCAF to the wave of strikes that swept Egypt in September. “The SCAF felt more in control and needed to clampdown on the empowered labour movement,” Fouad states. Following the imposition of a new ETUF committee, El-Borai announced on 28 November that the newly-formed Egyptian Federation of Independent Trade Unions (EFITU) had agreed to join the state-run ETUF, creating much alarm and sending signals that the government no longer valued union pluralism or freedoms. Though confusion and speculation is still rife, it would seem that such a consensus between independent unionists and their state-affiliated counterparts never truly existed. “We will not get involved with them in any respect. We reject the notion of a state-run trade union,” Fatma Ramadan, a board member of the EFITU and labour activist, stresses. Ramadan had to withdraw her candidacy in the People's Assembly (Parliament's lower house) elections, after administrative courts in the governorates of Giza and Menoufiya (both in the upcoming second round of elections) refused to accept candidates who received their workers' status from the independent general union. According to Ramadan, the EITUF authorised the candidacy of between 300 and 400 workers for Egypt's three stage People's Assembly elections. Of those, around ten unionists, including Ramadan, were denied the right to stand for elections as workers. In a 20 July decree, the ruling SCAF maintained a 47-year-old quota for representatives of workers and peasants in both the upper and lower houses of Egypt’s Parliament. Unionists are divided on whether this quota should be consigned to the fate of the old-regime or refashioned. “The 50 per cent quota for workers and fellahin is meant to protect these sectors: give them a voice, but when the quota is used to fill parliament with businessmen and technicians who do you think they will defend: themselves or the workers?” asks Ramadan. While the country’s first post-Mubarak elections promise to bring to power what some observers predict will be the most legitimate parliament since the 1930s, the make-up of the forthcoming parliament will to a varying degree determine the course of the workers’ movement. First round results reveal strong electoral gains by the Muslim Brotherhood's political arm, the Freedom and Justice Party (FJP), and the Salafist Nour Party. Even with two rounds left in the People's Assembly elections, many observers believe an Islamist takeover is now inevitable. Should Islamists come to power, the labour movement can expect to come up against certain obstacles. The FJP has previously condoned the ruling SCAF's opposition to strikes, going a step further by attempting to force an end to teacher's strikes in some governorates last September. The Nour Party has also taken an anti-strike line, calling such labour actions, at this point in time, “undesirable.” The only liberal list to make any substantial gains in the first round was the Egyptian Bloc. The Free Egyptians, the Bloc's leading partner, also has an unfavourable labour stance which it made clear when it quickly declared its support of the ruling military council's anti-strike law in July. Nevertheless, some labour activists are resolute: “We are undeterred by parliamentary elections; the battle for parliament is only part of the struggle. The street is where our main fight lies. We demand the right to freely unionise, an end to the law criminalising strikes, a minimum and maximum wage, the restart of stalled factories and the rehiring of their workers, an increase in pensions and adequate health care,” Ramadan states. According to labour lawyer and Revolutionary Socialists member Haitham Mohamedein, “The true issue lies in the law.” Specifically Law No 35 (1976), which outlined the structural and electoral regulations of the state-run ETUF among other central organisations. The ruling military junta’s decision to shelve the draft legislation, approved by the Manpower Ministry and then by Sharaf's Cabinet, is the crux of the matter, Mohamedein believes. The legislation would allow, for the first time since the 1950s, trade union pluralism and freedoms for workers and businessmen to form their own unions and syndicates respectively, but strong unions and syndicates would challenge a system that breeds corruption, oligarchy and social inequality. The unions demanded pay rises. The unions demanded minimum wage legislation. The unions demanded strikes. The unipons demanded,demanded,demanded. Now Egypt's coffers are empty. The unions demands have bankrupted Egypt. That is what unions do, they demand more of everything until everything is gone. The unions in the US demanded more pay and benefits, the companies moved those jobs overseas. Now the unions cry about not having jobs.